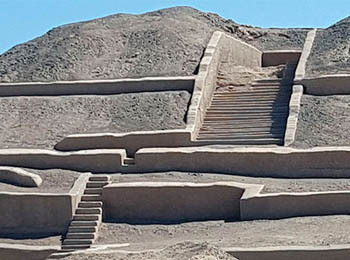 CAHUACHI is a huge archaeological site, located on a chain of small tree-less hills that overlooks the Nazca Lines. 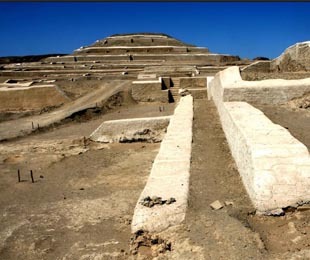 The site consists of a group of adobe pyramids, and the ruins of large rooms, and huts. It is one of the least excavated archaeological sites on the coast; so one may assume many of its secrets remain to be discovered. 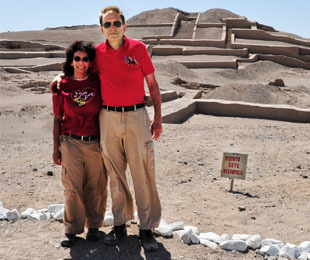 Originally, archaeologists believed that Cahuachi was the capital of the Nazca civilization. In recent years, this theory has not been supported by the archaeological evidence. Archaeologists now believe that Cahuachi is a sacred site for the Nazcans, a place where a mysterious once-per-year pilgramage occured. For most of the year the site was like a “ghost town”, populated only by a handful of caretakers and priests. Once per year, tens of thousands of religious devotees would flood into the region to take part of religious rituals, whose purpose and methodology remains unknown. One unusual feature of this site: about a dozen naturally occuring hills were modified to the Nazcans, to APPEAR that they were human constructions. Why was this done? Were the Nazcan priests trying to emphasize their wealth without having to invest in actually creating large structures? This is totally unknown, and subject to complete speculation. Your friendly driver will pick you up at your hotel, and you will meet your professional english-speaking tour guide. Together you will travel for approximately 45 minutes to Cahuachi. Here you will enjoy a privately guided tour of the ruins, to learn about the current theories that archaeologists are developing regarding this enigmatic but huge set of ruins. Then you will head back to your hotel in Nazca. 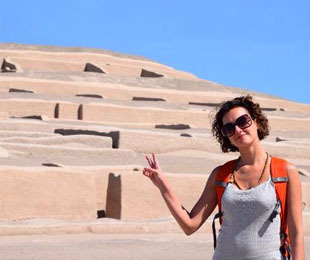 It is easy to combine this tour with a FLIGHT OVER THE NAZCA LINES.